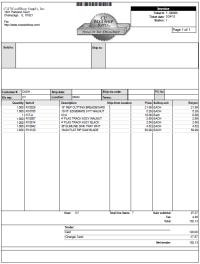 Multiple printers can be defined for each POS station, including 40-column receipt printers, full-width invoice printers, warehouse picking printers, check validation printers, admission ticket printers, etc. An unlimited number of forms may be printed for each sale, quote, hold, or order. Forms may include tickets, sales drafts, invoices, or even special forms such as Material Safety Data Sheets or custom contracts. CounterPoint includes pre-defined forms for receipts, picking tickets, and invoices. You may define new forms or customize existing forms. Individual form layouts may be Crystal .rpt files, OPOS .xml files, or static documents such as Word or PDF files. Graphics, such as your company logo, may be printed on receipts or invoices. Multiple forms can be grouped together, and the group becomes “active” under certain, user-defined conditions. For example, when a ticket is completed, the pre-defined group “TICKETS” will print a receipt and a credit card sales draft, and, if appropriate, a gift certificate. CounterPoint retains complete history for management reporting in detailed (line-by-line) format. Detailed history by customer and item can be retained indefinitely and is limited only by disk space. A complete history of a customer’s sales activity can be printed or viewed, showing every item purchased, transaction dates, and prices paid. Similarly, you can review an item’s detailed history. 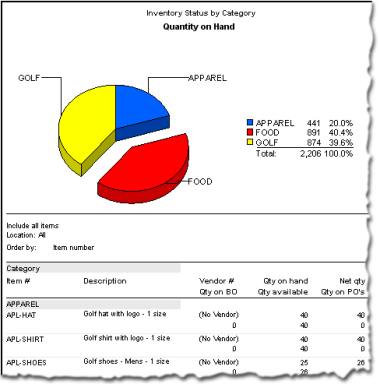 In addition to detailed history, summarized history can be printed for item categories, users, salespersons, stations, etc. Historical reports can provide valuable information such as a comparison of sales for Easter week this year with Easter week last year.